This protocol describes a novel three-dimensional in vitro model, where corneal stromal cells and differentiated neuronal cells are cultured together to assist in the examination and understanding of the interactions of the two cell types. Sharif, R., Priyadarsini, S., Rowsey, T. G., Ma, J. X., Karamichos, D. Corneal Tissue Engineering: An In Vitro Model of the Stromal-nerve Interactions of the Human Cornea. J. Vis. Exp. (131), e56308, doi:10.3791/56308 (2018). Tissue engineering has gained substantial recognition due to the high demand for human cornea replacements with an estimated 10 million people worldwide suffering from corneal vision loss1. To address the demand for viable human corneas, significant progress in three-dimensional (3D) tissue engineering has been made2,3,4. These cornea models range from simple monolayer systems to multilayered models, leading to 3D full-thickness corneal equivalents2. However, the use of a 3D tissue-engineered cornea in the context of in vitro disease models studied to date lacks resemblance to the multilayered 3D corneal tissue structure, function, and the networking of different cell types (i.e., nerve, epithelium, stroma, and endothelium)2,3. In addition, the demand for in vitro cornea tissue models has increased in an attempt to reduce animal testing for pharmaceutical products. Thus, more sophisticated models are required to better match systems to human physiological requirements, and the development of a model that is more relevant to the patient population is absolutely necessary. Given that multiple cell types in the cornea are affected by diseases and dystrophies, such as Keratoconus, Diabetic Keratopathy, and Fuchs, this model includes a 3D co-culture model of primary human corneal fibroblasts (HCFs) from healthy donors and neurons from the SH-SY5Y cell line. This allows us for the first time to investigate the interactions between the two cell types within the human corneal tissue. We believe that this model could potentially dissect the underlying mechanisms associated with the stromal-nerve interactions of corneal diseases that exhibit nerve damages. This 3D model mirrors the basic anatomical and physiological nature of the corneal tissue in vivo and can be used in the future as a tool for investigating corneal defects as well as screening the efficacy of various agents before animal testing. In the human body, the cornea is the most densely innervated tissue. The nerves are responsible for various sensations like touch, pain, temperature, and also have an essential role in wound healing, blink reflexes, tear production, and secretion5,6,7. In the cornea, stromal nerve trunks arise from the limbal plexus and enter the peripheral corneal stroma radially. The stromal nerve organization is parallel to the collagen lamellae and they further branch into smaller fascicles as they proceed towards the superficial stroma5,8. The nerve fibers further penetrate the epithelial layer and thus, innervation is widely spread out across the corneal epithelium and stroma. Therefore, innervation has an essential role in the healthy and diseased state of the cornea. In this protocol, we reveal the advancement of a novel 3D in vitro model, which is the first of its kind to mimic the in vivo stromal-nerve interactions. The SH-SY5Y cell line was used for this study, as it is one of the most established, well characterized lines used to study neuronal growth. The SH-SY5Y cell line has been described to produce both substrate adherent (S-type) and neuroblastic (N-type) cells that can undergo transdifferentiation9. As a result, even though this cell line is derived from a triple successive subclone selection of N-type cells, it also contains a small number of S-type cells capable of undergoing differentiation into neurons through the use of retinoic acid and brain-derived neurotrophic factor9. This provides a tool that may lead to a better understanding of the corneal complications associated with diabetic retinopathy (DM) and other ocular diseases. Due to the difficulties associated with obtaining and culturing neurons from patients with ocular disease, this 3D in vitro model provides substantial implications in studying the neuronal interactions and signaling with the corneal stroma. Diseased conditions often affect various tissues of the body at a very large scale, leading to a compromised quality of life. Ocular dystrophies are common complications often associated with systemic diseases and lead to loss of visual acuity or even permanent vision loss. Comprehensive studies are often essential for a better understanding of the disease condition as well as the effects at the basal cellular level. To study the effects of such diseases, various in vivo and in vitro models have been developed with the help of tissue engineering applications. Corneal tissue engineering applications have garnered great interest across various fields of science10,11,12,13,14, but there are still major limitations during actual application, including corneal graft rejections, infections, and scarring10,11,12,13,14. There are several studies that have successfully developed and established various in vitro models3,15,16,17,18,19,20,21,22,23,24,25,26. The 3D in vitro models are the most promising and of great scientific interest. 3D models are known to better mirror the in vivo cellular and physiological events that are critical during fibrosis and wound healing15,27,28,29. These in vitro models play an integral role in finding new therapeutic approaches for treating different disease conditions including corneal complications. Despite the critical role of innervation in corneal functions, little effort has been made to promote peripheral nerve proliferation within corneal tissue-engineered constructs2,3. However, the proposed 3D in vitro cell constructs mimic the target tissue in order to attain the desired tissue functionality. While diabetic keratopathy is an obvious application for the model described here due to the neuronal defects, there are several other corneal diseases that can benefit from a human in vitro model including Keratoconus and Fuchs dystrophies. Our 3D model emerges from this prospect and proposes the development of an in vitro representation of corneal tissue to assess drug delivery and safety of new ocular medicines. This protocol follows the guidelines of the University of Oklahoma Health Sciences Center/Institutional review board (IRB #4509). All parts of the protocol met the tenets of the declaration of Helsinki. Corneal samples were obtained from the National Development and Research Institute (NDRI) and the Oklahoma Lions Eye Bank. Upon receipt of the human cornea tissue samples, transfer the tissues into a 21.5 cm2 Petri dish containing 2 mL of sterile Dulbecco's phosphate-buffered saline (DPBS) (1x). Scrape and remove the corneal epithelium by positioning the cornea dome face-up. To ensure complete removal, scrape off the epithelial layer thoroughly using a razor blade at a 45° angle. Next, flip the cornea dome face-down and thoroughly scrape off the endothelium from the stroma with a razor blade at a 45° angle to ensure complete removal. Wash the stromal tissue with DPBS. Cut the stromal tissues into small pieces, using a number 10 surgical blade, keeping the stromal pieces wet at all time using DPBS. Pick stromal pieces up with sterile forceps and place into a T25 culture flask without media (4 or 5 pieces of 2 x 2 mm tissue per flask). Allow the explants to adhere to the bottom of the flask at 37 °C for about 30 - 40 min. Once adhered, slowly add Eagle's minimum essential medium (EMEM) containing 10% fetal bovine serum (FBS) and 1% Antibiotic/Antimycotic to the flask without disturbing the explants. Gently place the flask in the incubator at 37 °C, 5% CO2. Leave the explants undisturbed until the cells begin isolating and migrating in the flask. After approximately 2 - 4 weeks, cells should reach 100% confluence. Upon 100% confluence, passage the cells by removing the tissue culture media and wash the cells with DPBS. Add trypsin to the cells and then incubate them at 37°C. After approximately 5 min, view the cells under light microscopy to confirm that they have detached, and then halt the proteolysis by adding fresh media. Transfer the cell suspension into a 15 mL conical tube for centrifugation at 1,000 x g. Remove the supernatant carefully without disturbing the pellet and suspend the cells in fresh EMEM 10% FBS 1% Antibiotic. Count the cells and seed about 1 x 106 cells in T75 culture flask for further expansion with fresh EMEM 1% FBS 1% Antibiotic. To assemble 3D constructs from explants previously grown in EMEM 10% FBS 1% Antibiotic/Antimycotic, passage and count HCFs. Seed approximately 1 x 106 cells/well of primary HCFs on polycarbonate membrane inserts with 0.4-µm pores from the 3D constructs, along with 1.5 mL of fresh EMEM 10% FBS 1% Antibiotic/Antimycotic to the top of the construct. Add another 1.5 mL of the same media to the bottom of each construct. After 24 h of cell seeding, culture the cells with EMEM 10% FBS 1% Antibiotic/Antimycotic, stimulated with 0.5 mM 2-O-α-D-glucopyranosyl-L-ascorbic acid (Vitamin C) by adding 1.5 mL on the top and 1.5 mL on the bottom of each construct. Maintain the cultures in an incubator at 37 °C, 5 % CO2 for 3 weeks and supply fresh media every other day during the entire study period. No further passage is needed. After 3 weeks, add 8 x 103 cells/well of SH-SY5Y human neuroblastoma cells on the top of the previously assembled 3D constructs containing 1.5 mL of the EMEM containing 10% FBS, 1% Antibiotic/Antimycotic, and 0.5 mM 2-O-α-D-glucopyranosyl-L-ascorbic acid (Vitamin C). Allow the SH-SY5Y neuroblastoma cells to grow on top of the cornea stromal cells for at least 24 h before initiating cell differentiation. Initiate SH-SY5Y cell differentiation by stimulating the cells with EMEM containing 1% FBS and 1.5 mL of 10 µM Retinoic Acid on top of the construct. Add 1.5 mL of the EMEM 10% FBS 1% Antibiotic/Antimycotic 0.5 mM 2-O-α-D-glucopyranosyl-L-ascorbic acid (Vitamin C) to the bottom of the construct. Note that the Retinoic Acid step should be performed in the dark. Continue to culture the cells in this differentiation media for 5 days. When the cells reach the differentiation phase, switch the cells to 1.5 mL of serum-free media containing 2 nM of Brain-derived neurotrophic factor (BDNF) and 1% Antibiotic/Antimycotic added to the EMEM, by adding to the top of the construct. Add 1.5 mL of the EMEM 10% FBS 1% Antibiotic/Antimycotic 0.5 mM 2-O-α-D-glucopyranosyl-L-ascorbic acid (Vitamin C) to the bottom of the construct. Note that the BDNF step should be performed in the dark. Culture the cells for 2 additional days before processing for any further analysis as indicated in Table 1. Figure 1 is a step-by-step representative image of the working 3D in vitro model. At the first step, cells are isolated from human corneas. Then, they are grown on a polycarbonate membrane and stimulated with Vitamin C to assemble a self-secreted 3D matrix. This 3D construct system induces the synthesis of a multilayered cellular in vivo-like stromal matrix. Thereafter, neuroblastoma cells are seeded on top of the stromal cells followed by initiating neuronal cell differentiation. This leads to the co-culture of the corneal stromal cells and differentiated neuronal cells in the 3D in vitro model. 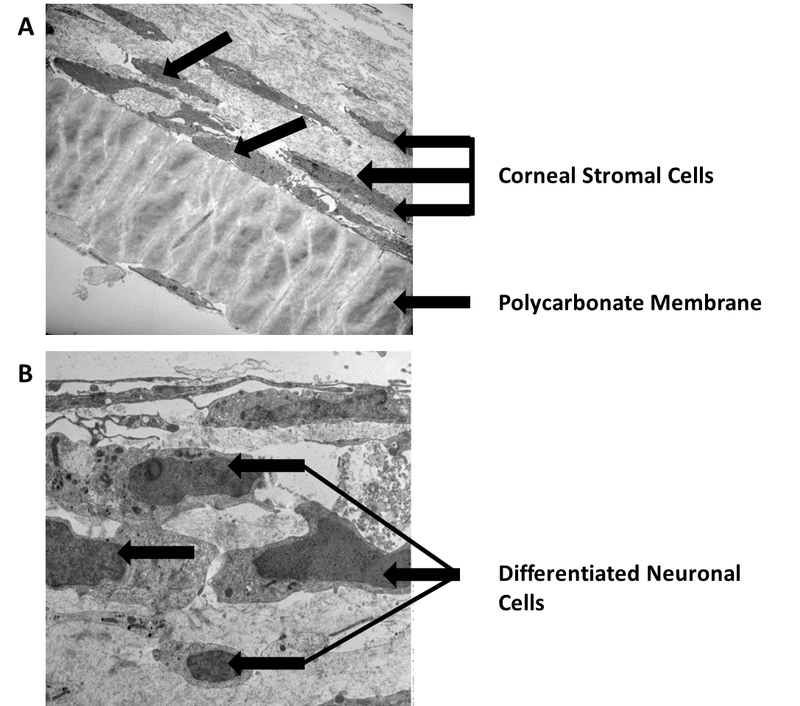 Figure 2 is the high magnification transmission electron microscopy (TEM) image of the 3D self-assembled construct (Figure 2A) showing the polycarbonate membrane and the corneal stromal cells seeded on top, secreting a self-assembled matrix followed by (Figure 2B) differentiated neuronal cells seeded on top showing a stromal neuronal cell arrangement. The arrows in the image show the neuronal cells. Given the direct crosstalk between the corneal stroma and neuronal cells, we believe the key players that affect the regulation of the corneal defects exist in the stroma layer. Therefore, this model presents a human neuronal in vitro model differentiating SH-SY5Y neuroblastoma cells into a sustainable neuronal morphology by combining it with our previously established 3D model of extracellular matrix (ECM) culturing with various differentiating factors. Thus, we suspect that this model will enable future studies of the morphological and molecular differences between healthy and diseased ECM. We believe that this novel 3D in vitro model will help dissect crucial aspects of the corneal stroma-nerve interactions associated with corneal pathology and pave the way for the development of new therapeutics. Figure 1: Illustrative Image showing the 3D in vitro co-culture model in a step-wise manner. 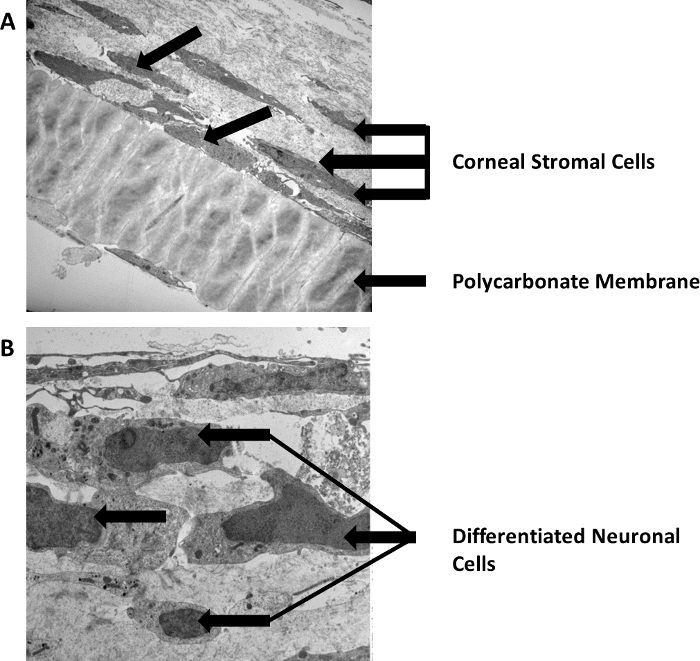 This image shows the cell isolation from the human cornea, and stromal cells seeded on a polycarbonate membrane, located in the 3D construct, cultured in EMEM and stimulated with Vitamin C. Furthermore, differentiated neuronal cells are shown to be seeded on top of the stromal cells. Please click here to view a larger version of this figure. Figure 2: High magnification TEM image of the 3D in vitro system. (A) Stromal cells arrangement on top of the polycarbonate membrane. (B) Seeded differentiated neuronal cells on top of the stromal cells. Scale bars = 500 nm. Please click here to view a larger version of this figure. Several studies have been focused on developing various animal models that can help develop a better understanding of corneal diseases as well as discover treatments. However, a significant value to humans from these studies has not been verified. To date, various in vitro models have been developed and widely investigated due to their remarkable clinical significance. Our previously established 3D in vitro model is a novel system that significantly contributes to medical science advancements in vision research and shows immaculate ability of recapitulating in vivo events in vitro28,29,30. The aim of this protocol is to develop the next generation of this in vitro corneal model that can be used to study cellular and molecular mechanisms of complications associated with corneal diseases such as diabetic keratopathy, keratoconus, and Fuchs. Such advancement could provide solid foundations towards the discovery of new treatments that are much needed clinically. This model may help in identifying different structural and cellular alterations taking place in DM and other corneal diseases. This provides substantial implications, including the possibility for screening for these diseases at an initial stage to potentially help with disease management. The model proposed here is simple, but it is highly innovative. One of the most significant advantages is that the corneal stromal cells are allowed to secrete and assemble their own ECM instead of being seeded onto an artificial environment. In addition, nerves are allowed to differentiate to more accurately model corneal stromal nerve interactions. Hence, this method provides the ability to study the human corneal stroma and nerve network, as well as the cells that reside within the stroma environment. This cultural platform will allow future investigations of complex cell-cell and cell-matrix interactions that influence the diseased states of the cornea. This 3D in vitro model approach is anticipated to provide improved and novel insight into disease mechanism, particularly when compared to current conventional culture systems or animal models. The described generation of this 3D in vitro model will pave the way for future therapeutic treatment and discoveries. We would like to extend our sincere thanks to Dr. Ben Fowler for his technical help with the TEM experiments. Pascolini, D., Mariotti, S. P. Global estimates of visual impairment: 2010. Br J Ophthalmol. 96, (5), 614-618 (2012). Rönkkö, S., Vellonen, K. -S., Järvinen, K., Toropainen, E., Urtti, A. Human corneal cell culture models for drug toxicity studies. Drug Delivery and Translational Research. 6, (6), 660-675 (2016). Ghezzi, C. E., Rnjak-Kovacina, J., Kaplan, D. L. Corneal tissue engineering: recent advances and future perspectives. Tissue Eng Part B Rev. 21, (3), 278-287 (2015). Shafaie, S., Hutter, V., Cook, M. T., Brown, M. B., Chau, D. Y. S. In Vitro Cell Models for Ophthalmic Drug Development Applications. BioResearch Open Access. 5, (1), 94-108 (2016). Shaheen, B. S., Bakir, M., Jain, S. Corneal nerves in health and disease. Surv Ophthalmol. 59, (3), 263-285 (2014). Beuerman, R. W., Schimmelpfennig, B. Sensory denervation of the rabbit cornea affects epithelial properties. Exp Neurol. 69, (1), 196-201 (1980). Heigle, T. J., Pflugfelder, S. C. Aqueous tear production in patients with neurotrophic keratitis. Cornea. 15, (2), 135-138 (1996). Wang, S., et al. In vitro 3D corneal tissue model with epithelium, stroma, and innervation. Biomaterials. 112, 1-9 (2017). Ross, R. A., Spengler, B. A., Biedler, J. L. Coordinate morphological and biochemical interconversion of human neuroblastoma cells. J Natl Cancer Inst. 71, (4), 741-747 (1983). Griffith, L. G., Naughton, G. Tissue engineering - Current challenges and expanding opportunities. Science. 295, (5557), (2002). Guo, X., et al. Morphologic characterization of organized extracellular matrix deposition by ascorbic acid-stimulated human corneal fibroblasts. Invest Ophthalmol Vis Sci. 48, (9), 4050-4060 (2007). Karamichos, D. Ocular tissue engineering: current and future directions. J Funct Biomater. 6, (1), 77-80 (2015). Karamichos, D., Brown, R. A., Mudera, V. Collagen stiffness regulates cellular contraction and matrix remodeling gene expression. J Biomed Mater Res A. 83, (3), 887-894 (2007). Ruberti, J. W., Zieske, J. D. Prelude to corneal tissue engineering - gaining control of collagen organization. Prog Retin Eye Res. 27, (5), 549-577 (2008). Karamichos, D., Guo, X. Q., Hutcheon, A. E., Zieske, J. D. Human corneal fibrosis: an in vitro model. Invest Ophthalmol Vis Sci. 51, (3), 1382-1388 (2010). Chen, F. M., Liu, X. Advancing biomaterials of human origin for tissue engineering. Prog Polym Sci. 53, 86-168 (2016). Priyadarsini, S., Sarker-Nag, A., Rowsey, T. G., Ma, J. X., Karamichos, D. Establishment of a 3D In Vitro Model to Accelerate the Development of Human Therapies against Corneal Diabetes. PLoS One. 11, (12), e0168845 (2016). Karamichos, D., Hjortdal, J. Keratoconus: tissue engineering and biomaterials. J Funct Biomater. 5, (3), 111-134 (2014). Wilson, S. L., Yang, Y., El Haj, A. J. Corneal Stromal Cell Plasticity: In Vitro Regulation of Cell Phenotype Through Cell-Cell Interactions in a Three-Dimensional Model. Tissue Engineering Part A. 20, (1-2), 225-238 (2014). Proulx, S., et al. Reconstruction of a human cornea by the self-assembly approach of tissue engineering using the three native cell types. Molecular Vision. 16, (234-236), 2192-2201 (2010). Gonzalez-Andrades, M., et al. Establishment of a novel in vitro model of stratified epithelial wound healing with barrier function. Sci Rep. 6, 19395 (2016). Hopkins, A. M., DeSimone, E., Chwalek, K., Kaplan, D. L. 3D in vitro modeling of the central nervous system. Prog Neurobiol. 125, 1-25 (2015). Schulz, S., et al. Natural Corneal Cell-Based Microenvironment as Prerequisite for Balanced 3D Corneal Epithelial Morphogenesis: A Promising Animal Experiment-Abandoning Tool in Ophthalmology. Tissue Engineering Part C-Methods. 20, (4), 297-307 (2014). Gao, J., Wang, Y., Zhao, X., Chen, P., Xie, L. MicroRNA-204-5p-Mediated Regulation of SIRT1 Contributes to the Delay of Epithelial Cell Cycle Traversal in Diabetic Corneas. Invest Ophthalmol Vis Sci. 56, (3), 1493-1504 (2015). Koulikovska, M., et al. Enhanced regeneration of corneal tissue via a bioengineered collagen construct implanted by a nondisruptive surgical technique. Tissue Eng Part A. 21, (5-6), 1116-1130 (2015). Zieske, J. D. Extracellular matrix and wound healing. Curr Opin Ophthalmol. 12, (4), 237-241 (2001). Karamichos, D., Hutcheon, A. E., Zieske, J. D. Transforming growth factor-beta3 regulates assembly of a non-fibrotic matrix in a 3D corneal model. J Tissue Eng Regen Med. 5, (8), e228-e238 (2011). Karamichos, D., Lakshman, N., Petroll, W. M. An experimental model for assessing fibroblast migration in 3-D collagen matrices. Cell Motil Cytoskeleton. 66, (1), 1-9 (2009). Karamichos, D., et al. Novel in Vitro Model for Keratoconus Disease. J Funct Biomater. 3, (4), 760-775 (2012).